I’m not bragging. That should be obvious because of the lackluster numbers. 🙂 What I’m doing is keeping track of my first year of building and marketing my brand. I’m sharing it publicly for those interested in following along. If you missed last month, here it is. Overall, this month was exciting. I had some strong improvements and some weak ones too. I published a really big post on the last day of the month. Hopefully that will bring in some decent traffic, but that will be reflected in next months stats. Again, Instagram was my big winner. I’m unable to get even my family members to like the Recharge Workshop Facebook page. Until I gain traction there or on Twitter, I don’t expect much. Instagram followers almost doubled. That’s great! I wonder if I can keep that up every month. I gained 1 Facebook like and 1 follow. I’m only counting likes here, but technically 2 more people are now following along with my posts. While it’s not a huge jump in the stats, it is forward progress. Lastly, nothing happened on Twitter. Does anyone use Twitter? I think I might dedicate some time to talk to random people on Twitter next month and see if I get some interaction. I missed some more planned posts this past month. But as I mentioned, I also published a really big post when completing my workshop organization project. I got some comments and that made me very happy. If I received almost no growth on anything but interaction, I would be ecstatic. 6 posts were added in February. This isn’t ideal, but if I can keep it at 5 or above each month, I will consider that a success. 0 new newsletter subscribers is sad, but I actually haven’t created the newsletter yet, nor have I been marketing it at all. 4 comments, yay! The past month saw 117 new page views. With fewer new posts, it would make sense to have less traffic. But since I’m also gaining social followers, I’m not sure what to think. 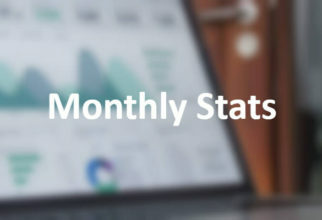 Next month’s stats should help to gain better perspective on what metrics are related. Once again, there’s really no point in showing you this next chart. Nothing has been posted for sale in my Etsy shop yet. But now that my shop is clean, I’m going to push for creating new products this coming month! 0 products, 0 sales, and 0 new follows. Expected. This has been another month of similar growth. I am thankful that most of my numbers have gone up. I’m going to try two things in March. I want to try communicating directly on Twitter and see if that will be worth the effort. I’m sure it will be for gaining followers, but hopefully it will also lead to more blog traffic. I’ll also be reaching out to other blogs and Instagram personalities to see if I can find some collaboration opportunities. Would you like to be a guest author? Get in touch!